FEMA’s Whole Community Approach and their push for more Public-Private Partnerships across the nation fits perfectly with our core mission of collaborating with groups to help educate communities while helping fund and support volunteers, first responders and others. For decades there have been many initiatives and programs offered by agencies and groups to get the public involved, but sadly there is still a ton of apathy and complacency in this country. One key thing is … we’ve got to find ways to make preparedness an integral part of society and make it so everyone benefits within each and every community. Our collaborative ideas can gently force preparedness data into homes and businesses using both public and private sectors … and … generate funds for local nonprofits, schools, volunteers + First Responders … and … create excitement about preparedness! helping CERTs, Scouts, VOADs, schools, etc earn funds + generate buzz by partnering with public & private sectors..! We recently setup a new page where FEMA Think Tank and National Preparedness Coalition members, CERT and MRC coordinators, Chambers, VOADs, Troop leaders and others can download a free IT’S A DISASTER! mini ebook and a 2-page overview with collaborative ideas and funding examples. Please share this mini ebook and overview with volunteers, agencies, businesses, churches, civic clubs and others trying to form Public-Private Partnerships in their communities! 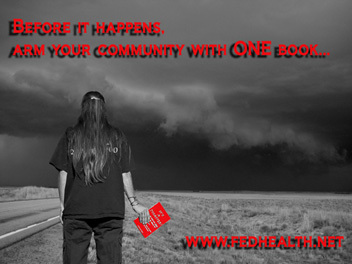 Visit www.itsadisaster.net/ppp.html to learn more or call Fedhealth at 1-888-999-4325 to discuss ways we can help support YOUR efforts! You are currently browsing the archives for the partnerships category.